Lower Young Lake, Mount Conness. Yosemite National Park, California. September 11, 2007. © Copyright G Dan Mitchell. 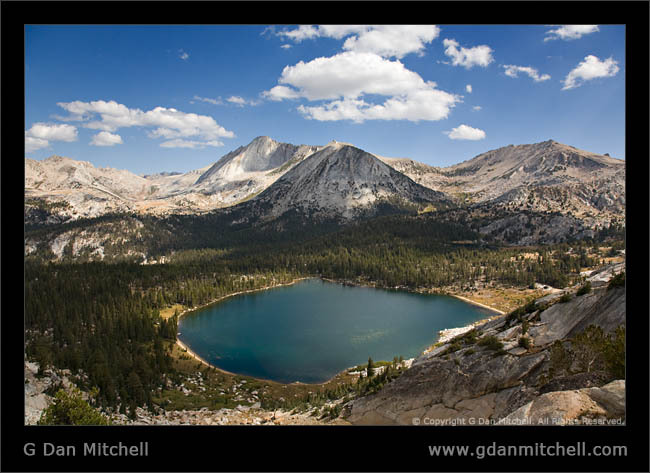 I have hiked the well-travelled path from Tuolumne Meadows past Dog Lake to Young Lakes several times. Every time I’ve crossed Dingley Creek, about 3.5 miles out on this trail, I’ve thought of two things: that the view of the Cathedral Range from here is one of the most astonishing vistas in Yosemite, and that it would be interesting to explore the open basin of Dingley Creek above the trail. On this past week’s short pack trip I got my chance. For now I’ll skip over the first two days of the trip, saying only that I hiked, I camped, I photographed, I got rained on, and it was a good trip. On day two, I spent some time shooting the breeze with a ranger who was on patrol in the area and, among other things, he mentioned that there was a shortcut back toward the Dog Lake Trail. He confirmed what I had read elsewhere and suspected from looking at my surroundings: there is a nice little route over the saddle just to the left of Ragged Peak (as viewed from Lower Young Lake) that ends up rather high in the Dingley Creek drainage and which cuts a perhaps as much as a mile off of the hike. But that’s not the main attraction – the scenery on this short alpine route is much more exhilarating than that on the regular trail. So, on the morning of the final day of my little trip I decided to forego the trail and instead check out this alternate route. From here the approach to the saddle was very obvious, and I crossed the base of this last slope to the left before ascending on rocky, sandy terrain to the top. The saddle was broad and fairly level with the very gentle slope descending in front of me along the base of the ridge before turning left and heading into the main basin of Dingley Creek. Through this section there was a fairly obvious trail, at least until the route descended through meadow and open forest towards the flatter section of the valley. At the bottom of this slope I angled ahead and right, planning to intersect with the main trail closer to the far side of the shallow valley. If you like a bit of cross-country travel and are in the area, this is a route that is well-worth the effort. Sometime I’d like to go back this way and bivy in upper Dingley Creek Basin – I think there are some real opportunities for great photographs of the Cathedral Range from this area.